Before we go on and talk about form as an element of design, let’s talk about the pleasant, joyful aspects of jewelry form. What makes it fun? What Are the Elements and Principles of Design? Peacock, by Heikki Seppä. Photo courtesy Nick Felkey. 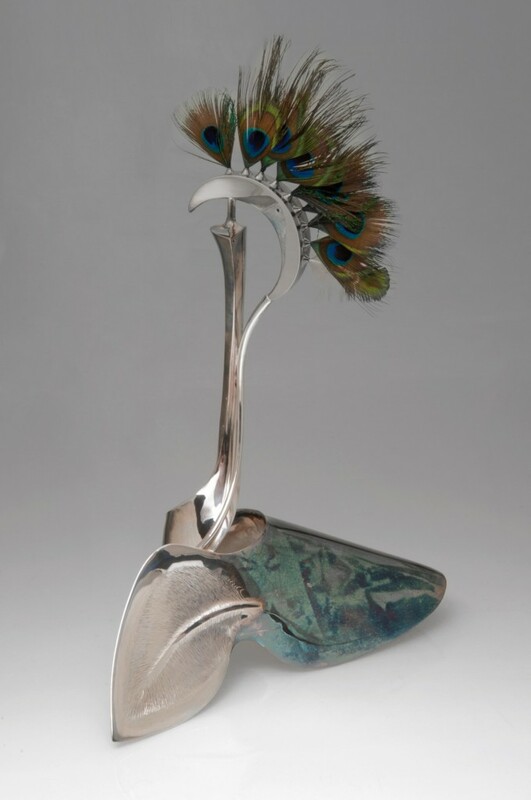 When master metalsmith Heikki Seppä began his career as a metalsmith, silvermithing was strongly influenced—even dominated, according to Seppä–by the silver hollowware industry. Hollowware makers had become focused on speed and mass production. As a result, the forms they used to make tea and coffee pots, candlesticks, and other silver pieces, were greatly influenced by the prolific industrial use of rotation forms—forms that can be created on a lathe. Why Learn a Formal Design Language? The best way to learn design is to look closely and analytically at the work of other artists—specifically, here, other jewelry makers. But for beginners, without the language to describe the formal qualities of design, how do you analyze the work? “I like it/I don’t like it/It’s good/It’s not good” is certainly a start, but then comes the question: Why? What makes it good or not good? Why does it hold your attention or not, stop your breath or not? And there, without a formal language, most analysis stops. By the way, the term “formal” in this context doesn’t mean classical, high-falutin’ or dressed up. It refers to the elements and principles of design from which “forms” are made, things like line, shape, space, balance, size and so on. Without a grasp of formal language, what can often happen is that a beginner, looking at other work, ends up simply copying or imitating it. The derivative work is almost always weak and less than it might have been. Worse, it is never truly one’s own. This talk of language, vocabulary, structure and form may sound like an academic discussion, but it really—as I finally found, after years of trying to ignore it–is not. Although artists express their ideas through various media–pigment for a painter, clay for a potter, music for a composer, or metal for a metalsmith or jeweler–we are still language-using creatures. We depend on language to describe, explore, and even, to some extent, create our world—even to ourselves. In fact, sometimes our understanding of our world and of ideas is limited by existing language. Which brings me to the amazing metalsmith Heikki Seppä, who discovered, or rediscovered, this when he began introducing his students to his ground-breaking concept of shell forms to his students. Learning to draw was a revelation to me. As a child, I thought you either did or did not have the talent to draw. I was convinced I did not have it, although I kept taking workshops and classes to try to learn. Finally, in my 30s, I took a workshop from the brilliant and inspiring art teacher, Beverly Cassel. Beverly taught me that it was not a matter of talent. It was a matter of learning to see. Yes, well that only took me so far. My drawings kept failing. Much as I respected Beverly, she must have been wrong and I really was missing the talent. But I kept taking classes. Including one that covered the elements and principles of design. I’d like to say the light came on. It didn’t. Because learning about line, form, balance, blah, blah, was like practicing scales: you know you should but…why? Can’t you just move ahead and play? Over the last many, many years, it’s been my privilege to interview and see the breathtaking work of a huge number of brilliant jewelry artists. And I’ve come to realize that they employ the elements and principles of design. I wondered to myself, how many beginning jewelry makers, like me those many years ago, keep wondering why their work fails? Even when they copy the work of those brilliant jewelry artists. Part of the answer, I think, may lie in the fact that many jewelry makers start their work without a structured art background—most art programs teach the elements and principles of design. Jewelry makers may start their work as a hobby, beading, or working with metal clays, or wire wrapping. They may take a class on metalsmithing and get stoked the first time the metal melts under their torch. Other jewelers learn on the job, at a bench, doing repairs, casting, or other jewelry work. When you learn to cast, forge, solder, set, string beads, wrap wire, or work with precious metal clay (PMC), you come to grips with one aspect of jewelry making—that of tools, techniques, methods and manufacturing. (Like managing paint, ink, or heaven forbid, glue.) But, like me, you may not know there is, or how to apply, a design language. When jewelry makers talk about design, they are often talking about how the object functions. Designing jewelry that functions well–a ring that doesn’t roll, earrings that are comfortable, or a catch that opens easily, but doesn’t open at the wrong time—is certainly one type of design. But here I’m talking about aesthetic design: Is there enough (or too much) contrast between these two textures; does this large pearl balance this selection of colored stone melee; is the work visually appealing, or even exciting. To answer (or even ask) these questions, artists of all kinds, I think, can be helped by learning the language of aesthetic design. Knowing the language of design helped me become a better painter/drawer, whatever it is I really do. But because I’ve spent so much of my life associated with jewelry, I wanted to help jewelry makers, who may not be familiar with it, to learn to this language. Hopefully, it will help them see ways they might apply it to their own work. As a result, with the enthusiasm of a convert, I began writing Good Bones: the Elements and Principles of Design for Jewelry Makers. Since life and work keep getting in the way, I decided to blog some of this information so that it can begin helping people until I can get the book finished. I hope this will prove useful to you.